My parents kept cars until they ran into the ground. I hated having my mother pick me up at high school in a car that should have been retired ten years ago. The darn thing was so old that it didn’t even have headrests. I would often stay in school late so that nobody could see me get into the old junker. I was worried that once I got my driver’s licnse my parents would think it was a good idea to upgrade then give me the antique on wheels. Thankfully that never happened as the car dies an awful death in our driveway one cold winter day in New Jersey. Thankfully, just in time, car manufacturers began to install headrests for safety. Little did they know that many years later, these important safety accessories would make an excellent mounting point for entertainment devices in the early 21st century. We have found the headrest makes a great mounting point for a lot of stuff. Especially useful for keeping backseat passengers entertained with your iPad or any tablet such as the Samsung Galaxy Tab. The posts to the headrest are typically the place where you would attach the mount. There are two kinds of headrest mounts for tablets. Once attached to the two posts of a single seat. Perfect height for little backseat passengers and far enough away so that the tablet cannot be turned into a Frisbee. This works well for a single passenger. Fights can ensure if you have more than one kid back there so for those families blessed with a larger family, consider what is called a centered mount. This type of mount attaches to the headrest posts but then telescopes so that your tablet is now located in the middle between the two front seats. No fights over who has the best angle to the tablet. Now the kids will just fight over what they are watching on the tablet. Maybe just buy a second headrest mount. It also makes a good mount point for some other purposes. One of our readers recently snapped some nice pictures while using the headrest to mount a camera within the car. Seemed kind of strange at first, but we took a look at the video shot while on the headrest and it was pretty darn good. You will find that many strap mounts made for motorcycles and bicycles will suit this purpose well. We also have a number of people who like to place their iPhone on the headrest and play music with the sound coming in from just behind the drivers head. We tried that as well and while we prefer the stereo in the car, it does work. If your car does not have a way to connect a device to your radio, consider an FM Transmitters. We have an article on FM transmitters for use with a satellite radio but it applies equally to any device including your iPhone. If you still want to mount your iPhone on a headrest and hear it, consider an inexpensive handlebar mount with a universal cradle. 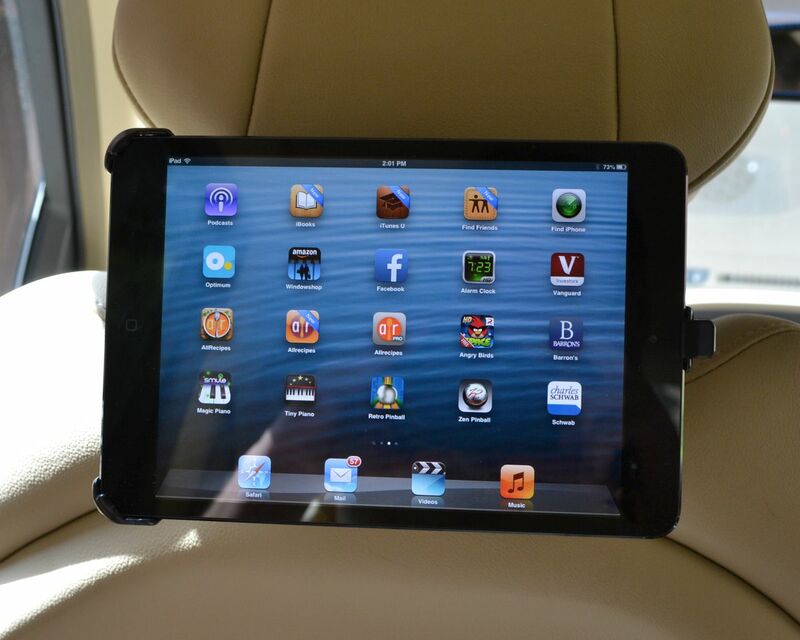 For a more detailed look at headrest mounts, you can read our latest article here.